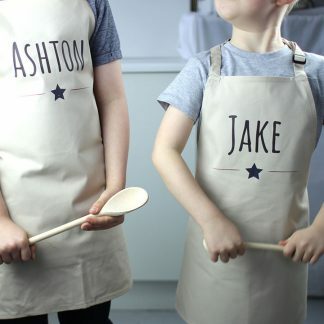 Delight any child with a unique personalised baking gift set with matching bag and optional personalised apron. 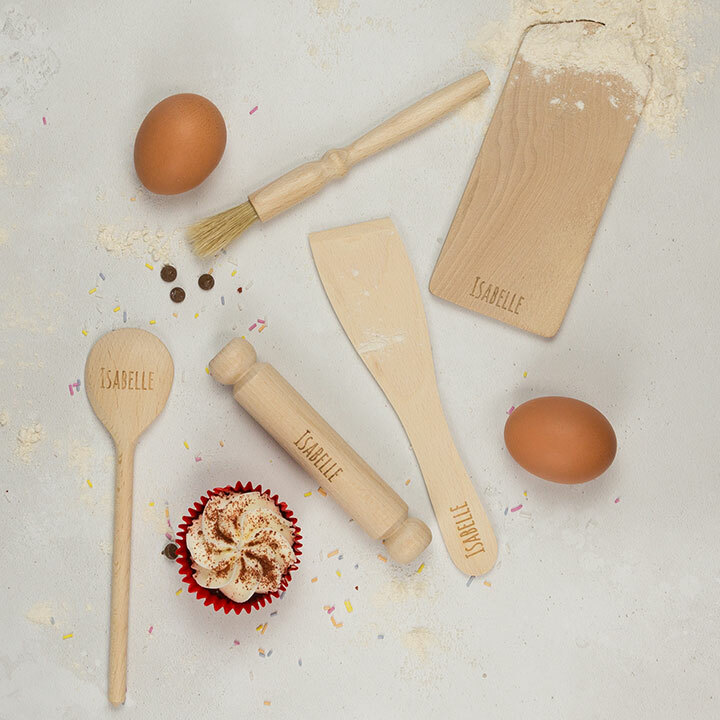 This beautiful set of child sized utensils include a rolling pin, spatula, pasty brush, spoon and cutting board. Each utensil (except the pasty brush) features your chosen name. All wrapped with a gender neutral ribbon ready for gifting. A bubble wreath design cotton drawstring bag also features your chosen name and the words “BAKING SET”. Please include apostrophes where necessary when entering your personalisation. This set (including matching apron) is suitable for children under 5 years old. We recommend our full sized utensil set for older children. Please note that the longer the child’s name, the smaller the text will appear. Utensil shapes, sizes and ribbon colour may differ from the images shown depending upon availability. Utensils are made from wood sourced from sustained beech forests in Eastern Europe. Cotton bag and apron are both made from 100% natural coloured cotton. Apron has a fully adjustable neck loop. Cotton Drawstring Bag: w20cm x h24cm.